Sunshine, pool time and other elements of summer can make barefoot walking a tempting option. But these opportunities can actually become quite concerning, and should be minimized for optimal foot care and health. This makes keeping a few foot care tips in mind important for all pedestrians. Summertime weather can make it easy to choose poolside flip flops as daily footwear. But the truth is that your beloved flip flops are not real shoes. Running shoes, closed-toe sandals and similar are considered to be legitimate footwear. When walking outdoors without actual shoes, you make your feet vulnerable to dirt, debris, infection and other unfavorable conditions. Shoes are not for show; they are protection for your feet! The sun of summer can be great for uplifting your mood and gaining a nice tan. Yet UV rays can also cause skin burns and damage. You may remember to add sunscreen to your face and shoulders, but do not neglect your feet! The skin on your feet is also susceptible to sun burn, so plan outdoor activities accordingly and apply sunscreen to the tops of your feet as well. Also remember to care for the bottoms of your feet. Sunshine can easily make the ground outside extremely hot, which is harmful to any pair of bare feet. During summer and other times of the year that your feet go through strenuous conditions, it is wise to give your feet regular once-overs. Pay attention to your arches, heels, toes, and the spaces in between your toes on each foot. Also remember to inspect your shoes, to ensure that they are clean and properly working for your feet. Call the Beaver Valley Foot Clinic Now! 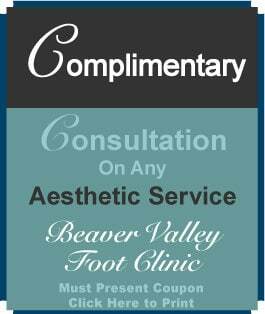 Superior summer foot care services are available at the Beaver Valley Foot Clinic. Call (724) 375-1577 now or stop into one of our convenient locations around Pittsburgh today. Dr. Christina Teimouri will tend to all of your foot and lower leg needs so that you can achieve ultimate health and foot care. 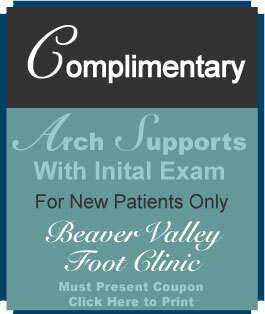 Contact the Beaver Valley Foot Clinic now to schedule an appointment today! 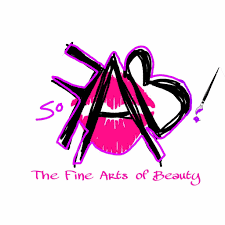 Check out some of our top cosmetic services!